Neil Shicoff (www.shicoff.com) was born in Brooklyn, New York. 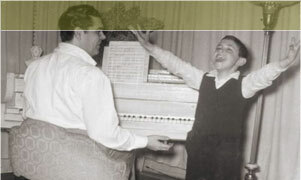 He studied at the Juilliard School of Music and with his father, the celebrated cantor Sidney Shicoff. He made his professional debut as the title hero in Verdi´s Ernani conducted by James Levine in CINCINNATI in 1975. As early as 1976, he made his debut at the METROPOLITAN OPERA as Rinuccio in Gianni Schicchi conducted by James Levine. Internationally recognized as the pre-eminent American tenor of his generation, Neil Shicoff has appeared at all of the world's most important opera houses including the METROPOLITAN OPERA, VIENNA STATE OPERA, LA SCALA, PARIS OPERA, ROYAL OPERA COVENT GARDEN, BERLIN'S DEUTSCHE OPER, BAVARIAN STATE OPERA, LYRIC OPERA OF CHICAGO, SAN FRANCISCO OPERA, HAMBURG STATE OPERA, GRAND THEATRE DE GENEVA, ARENA DI VERONA, NETHERLANDS OPERA, OPERNHAUS ZÜRICH, WELSH NATIONAL OPERA, SCOTTISH OPERA, SANTA FE OPERA, BARCELONA'S LICEU, and BUENOS AIRES TEATRO COLON. In addition to his operatic successes, he has sung with the Israel Philharmonic conducted by Leonard Bernstein, the Berlin Philharmonic conducted by Claudio Abbado, the San Francisco Symphony conducted by Edo de Waart, and the Boston Symphony Orchestra conducted by Seiji Ozawa. He has also collaborated with celebrated conductors such as Carlos Kleiber, Riccardo Muti, Giuseppe Sinopoli, James Levine, Charles Dutoit, Michael Tilson Thomas, Sir Charles Mackerras, Semyon Bychkov, James Conlon, Antonio Pappano, Carlo Rizzi, Donald Runnicles, Sylvain Cambreling, Neeme Järvi, and Riccardo Chailly. Known for his intensely passionate portrayals, Neil Shicoff has appeared in notable productions by Franco Zeffirelli, Jean-Pierre Ponnelle, Elijah Moshinsky, Götz Friedrich, Robert Carsen, Andrei Serban, Pier Luigi Pizzi, Werner Schröter, Lina Wertmüller, and Harold Prince among others. You can read more about Neil Shicoff at his official website.